“We No Speak Americano” – Yolanda Be Cool | Marbella Marbella – Adelante! We No Speak Americano is adapted from the original song composed in 1956 by Renato Carosone “Tu Vuo’ Fa L’ americano,”which referred to the many Italian emigrants who went to America to begin a new life and most of them could not speak any English (or americano, as they called it). This humorous song sums up their situation when trying to adapt to this new world and culture. The first wave occurred between the unification of Italy in 1861 and 1900. At the time of unification, Italy’s population was approximately 24 million. Over 7 million people emigrated over the next forty years, 66% from the northern regions and 33% from the south. More than half went to other European countries, while the rest went overseas to North and South America, Australia and New Zealand. The second period of mass migration occurred between 1900 and 1914, the beginning of World War I. During this time, over 9 million Italians, mostly from the rural south, sailed for North or South America. 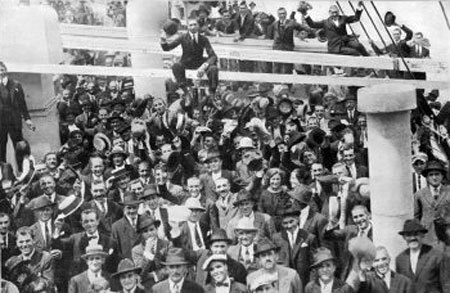 In 1913 alone, 872,598 people left Italy. The third wave of Italian emigration followed World War II, along with Europeans from a variety of countries. After six years of war, many people dreamed of a fresh start in a new homeland. The motives behind this mass exodus were complex, and often associated with the region where the immigrants originated, but poverty and lack of opportunity played a major role in their decisions to leave their families, friends, towns, villages and regions in Italy.